The team behind Gifted Geek have had a fantastic summer so far here in the UK. It’s 2018 and the weather has been unusually hot with day after day of endless sunshine and no rain whatsoever. We’ve also been fortunate in that this was the year we decided to test the most popular inflatable kayaks out on the River Thames. 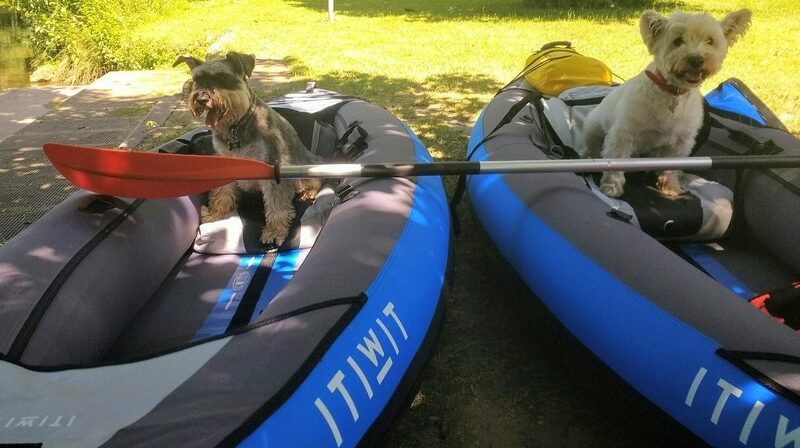 Dixie the Miniature Schnauzer and Scrappy the Westie loved the kayaks, but what did we think of them? Keep reading to find out. Easy to store – in a wardrobe, loft or even a spare room. Easy to transport – no need for a roof rack or van to transport them to the river or lake. You can even take them abroad as many will fit in the hold of aircraft. A competitive resale market – check out Ebay and you’ll find kayaks sell quickly, you can get a chunk of your money back if you get bored with kayaking. Not every 1-man kayak is built the same, we tried several that would not fit a 6-foot male. If you’re a big person, consider a 2-man one instead. The higher the air pressure, the more rigid the kayak and that’s a good thing, you don’t want too much flex. Check the packed weight carefully, some of the kayaks we tried weighed nearly 30kgs and that makes it difficult to carry them to or from the river/lake. Buy early in the year, the summer is peak season and when most outlets run low on stock. Online orders are more likely to be delayed in the summer. Look out for a shaped bow and stern and also check the size of the keel. These help to keep the kayak on heading and prevent it from changing direction too easily. Check how much the pump costs as many kayaks only work with certain types of pump. We know that readers of our site here at Gifted Geek will have different budgets and expectations so here are our two favourite inflatable kayaks. The first one is a good all-rounder and tops the list of affordable kayaks. The second is far more expensive and comes with all the bells and whistles but at a premium. 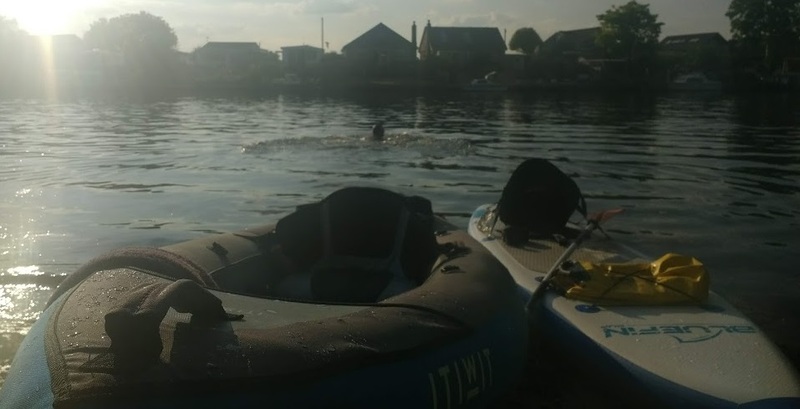 The Itiwit was the first inflatable kayak we tried and for around £200 it has proven to be a bargain. We’ve paddled over 80 miles on the River Thames with two Itiwit kayaks and while it’s not perfect, for the cost, it stands out above many other products at this price point. The Itiwit is lightweight at 14kgs, can be lifted out of the water by one person and is easy to carry around as it comes with its own carry bag. It takes only 5 minutes to pump up to the desired pressure and is very robust; the inner tubes are protected by an outer layer of removable material. The base is particularly durable and after 80 miles, we can’t see any damage or failure in either kayak. All the seams, glue and zippers look like new, not bad for 80 miles of use! 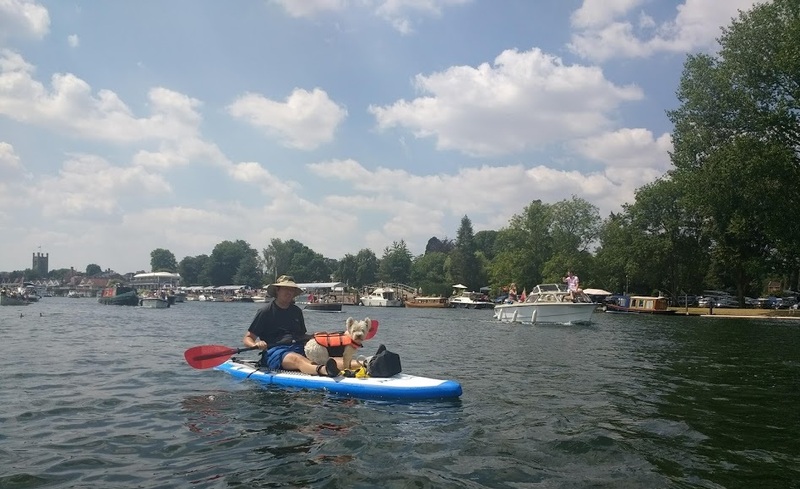 There’s also plenty of space in this 2-man kayak for both people, dogs and possessions. The Itiwit has very small fins under the kayak and lacks a pointed bow and stern. This, coupled with its banana shape mean this kayak doesn’t want to stay straight and turns at every opportunity. With each dip of the paddle, the kayak will turn considerably to either the left or right and after several miles of travelling, we were exhausted from spending so much energy just to keep it straight. 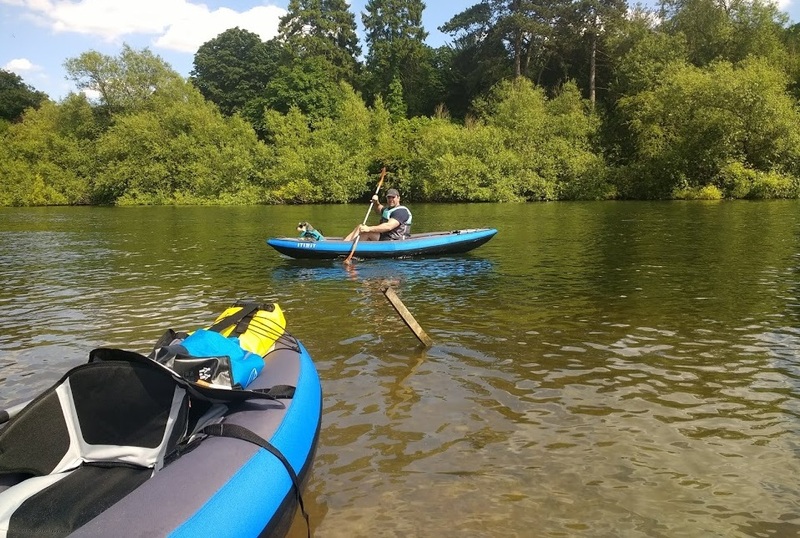 The Itiwit is perfect for occasional fun use either on a lake or river but as we were using it twice a week and travelling over 10 miles each time, it made sense for us to sell the Itiwits and upgrade to something more suited to long distance kayaking. In our opinion, the Itiwit is a great introduction to inflatable kayaking, it’s very stable and almost impossible to tip over. You can easily sell it via Ebay should wish to. It also comes in several colours and there’s a smaller 1-man version for those of you under 6 ft tall. This kayak is made from material that needs to be dried fully before it’s packed away from storage, otherwise it will smell of damp and mold may form. The Advanced Elements convertible ticked so many boxes for us, it was extremely rigid and felt similar to a solid kayak. It also had a pointed bow and stern, good-sized fins and came with an optional solid backbone which helped to keep the kayak rigid and straight. Based on our experience, this kayak fixed all the issues we found with the Itiwit but this came at a cost. The convertible Advanced Elements kayak, including the backbone which we recommend, cost us around £900. We particularly liked the available options on offer with this kayak. Chose from a 1-man setup or 2-man. Skirts are available to keep you dry and you have options for the floor; either a solid backbone or a high-pressure solid floor. The Advanced Elements kayak isn’t for occasional use, it’s more suited to the serious longer distance kayaker who wants a product that will fold away in the boot of a car. We absolutely loved this kayak and can see why it’s the top of the range. We used it in the one man configuration which left plenty of room for storage and of course, a dog too. There are only two things we dislike about it: The price and the weight. At nearly 25kgs, this was one of the heaviest inflatable kayaks we tested and a single person may struggle to remove this from the water on their own (without a slipway). At around £900 including the backbone, this is also one of the most expensive kayaks but the build quality can only be described as excellent. 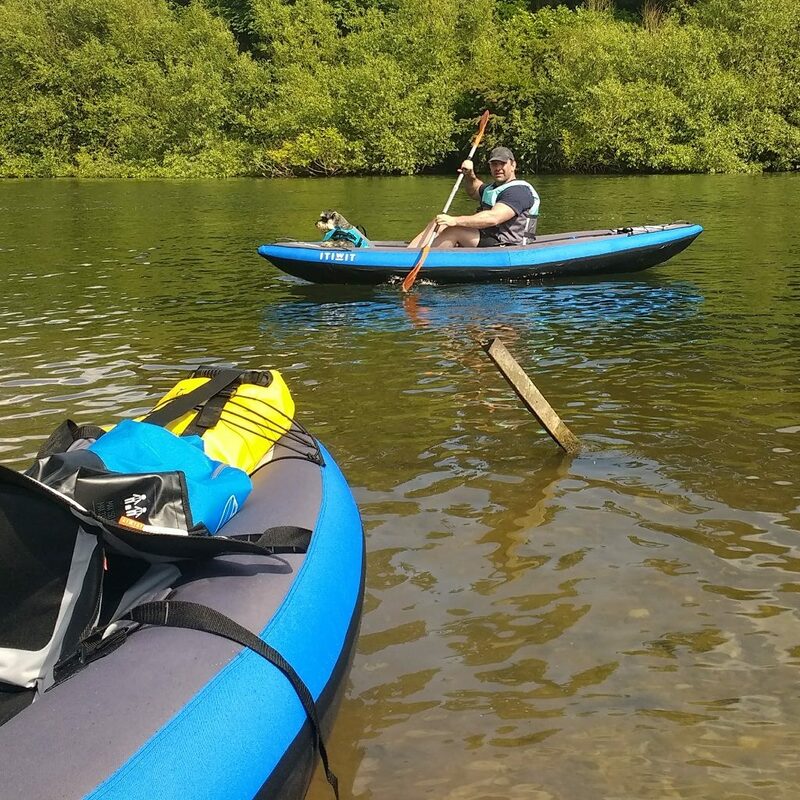 The Advanced Elements convertible stays on heading and cuts through the water like a solid rigid kayak, it looks great and the multiple configurations give you lots of options. If you don’t mind spending extra and want an inflatable kayak that mimics a solid kayak as close as possible, we suggest you try the Advanced Elements convertible. It’s also perfect for taller people who may struggle to fit comfortably in one the other smaller 1-man kayaks. 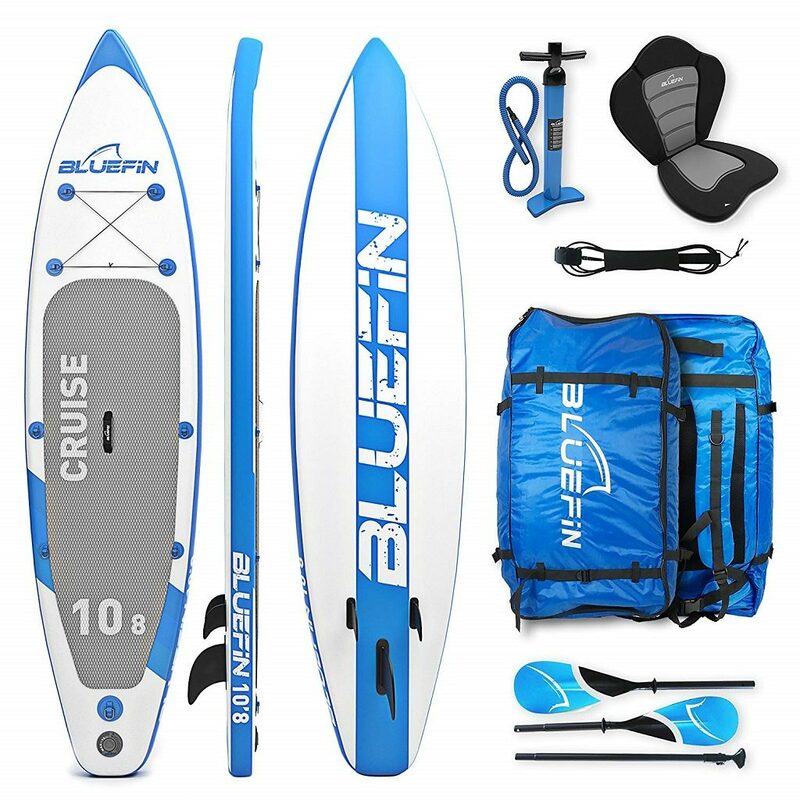 The Bluefin is actually a SUP (Stand Up Paddle Board) but with an optional conversion kit, can be easily used as a kayak. We really enjoyed using the Bluefin as a SUP and when we got tired of standing up, we just attached the optional seat and then set off in a classic kayak configuration. What really made this kayak stand out was the material used in its construction. The drop stitch material was extremely rigid, lightweight at 14kgs, tough as nails and super easy to clean. There’s no absorbent material on the Bluefin, so just wipe it clean with a cloth and then pack it away. We also liked how close we were to the water, without any sides to the board, we were only an inch or two from the water which was a nice experience. The Bluefin stayed roughly on track but it was difficult to build up any speed, the flat surface and lack of a pointed bow/ stern meant it didn’t cut through the water like the Advanced Elements kayaks we tested. If you want more than just a kayak and like the idea of stand up paddle boards, try the Bluefin with the optional seat configuration. We had great fun with ours and are sure we will do so in the future as we intend to keep one. 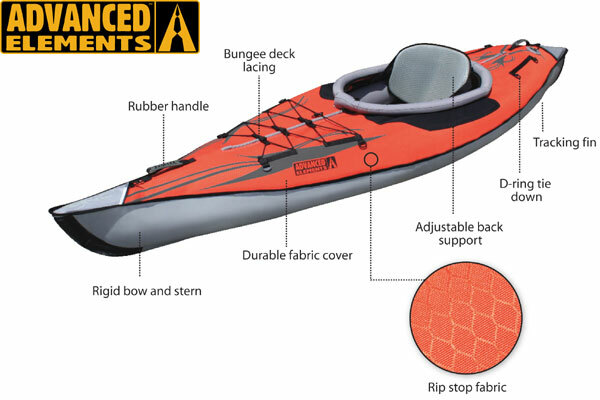 The Advanced Frame kayak is the smaller 1-man version of the Convertible that made it to #2 on our list. We tested this kayak on a short stretch of the river Thames, it was stable, stayed on heading, was quite short in length at 318cm and was light enough for one person to carry with ease. We also liked the range of options that are available with this kayak. The backbone is our preferred optional extra as it improves the tracking, making this kayak as easy to paddle as a rigid variant. The only issue we found with this kayak was a lack of space. 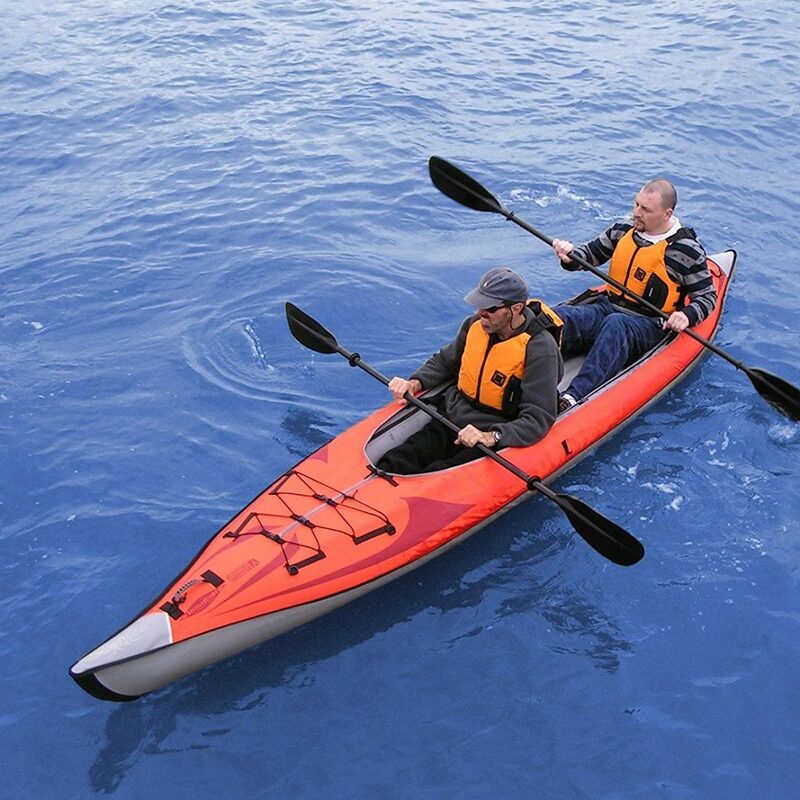 If you’re 5ft9 or under and of average build or slimmer, you should be able to fit in this kayak, but any taller or heavier and you may find the fit too tight. We only tested this kayak for a short period, it was well made and ticked so many boxes for us. Unfortunately, at 6ft and 6ft2 respectively, my friend Paul and I were far too tall for this kayak. If you like Advanced Elements kayaks (we think they’re great) but are a little on the tall side, consider the Convertible (460cm long) or the Expedition (400cm) both of these are longer than the Advanced Frame kayak (318cm) and both hold more weight too. This kayak made it into our top 5 list as it’s perfect for average or smaller people. 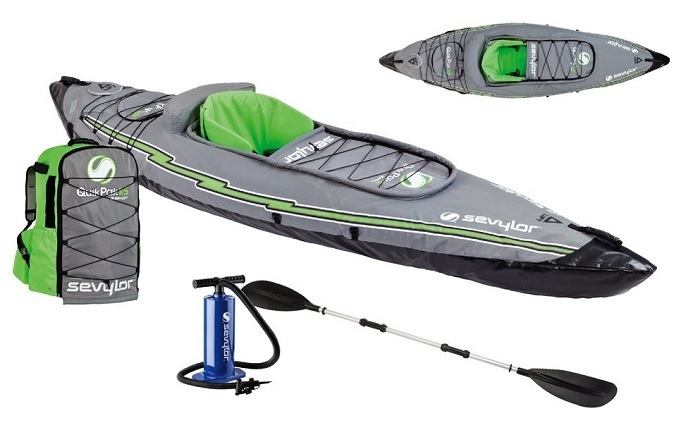 The Sevylor K5 is another kayak we tested and for the price, we felt it was a good compromise between the lower-end kayaks and the top-of-the-range products on sale. This is one of the lightest kayaks we tested and we particularly liked the padded shoulder straps attached to the carry bag. These made walking to the river a much easier and less painful task. Like the Advanced Frame, this kayak is best suited to a lighter, shorter person. With a maximum weight of 250lb (17.5 kg) a larger person, plus possessions etc would overload this light and nimble kayak. The K5 has a rigid bow and stern and along with its sleek design, should in theory stay on heading. We found that with aggressive paddling, this kayak, like the Itiwit, would turn very easily and we found it difficult to keep it in a straight line. The paddle that came with this kayak was of poor design but we had our own lightweight paddles. We only tested this kayak for a short spell, in part because we were far too big for it. A great kayak for persons of average or smaller frames and in terms of performance, comparable to, if not slightly better, than the Itiwit. The paddles that came with several of the kayaks we tested were mediocre at best. Heavy and cumbersome, we found they caused arm ache. If you’re planning on using the kayak for than just a gentle paddle around the pond, we suggest upgrading your paddle to something nice and light. We ditched our aluminium and plastic paddles and purchased ultra-light carbon fibre ones instead. The difference in performance was immediately noticeable with less arm ache and more distance travelled. The downside was the cost. At over £200 for one paddle, we appreciate that not everyone would want to fork out this much. It all depends on how much kayaking you intend to do. The lightweight carbon fibre paddles really did make a lot of difference.